Oh my goodness! These look obscenely delicious! I'm looking for my grocery list right now. I can hardly wait to get home today to make these...thanks for driving me crazy! Come on! Sometimes I really hate reading your blog! It makes me so hungry! That looks so delicious! Can't wait to try it out!!! Um, are you kidding me???? Those look very dangerous . . .
Oh My flipping heck, these look so sinfully good! OMG! I read reese's and clicked on this post so fast. I'm drooling here. I need to make this. There goes my diet.. again. Drooling on my keyboard here...I'm lovin' all the recipes. My family is going to eat good next week! I guess I'll be going to the grocery store tomorrow because I'm making these! Yum! These look so good! Thanks for stopping by my blog! Thanks for sharing a have a nice weekend! My husbands family would adore this! You're killin' me over here! I've been craving cheesecake like crazy...and with Reese's? I'm in heaven! Oh my!!! Just what the doctor ordered (or not - lol) This looks so wonderfully good I am going to have to give it a try. P.S. I am your newest follower, thanks for stopping by! Found your yummy recipe on Pinterest..if you have time, come on over and link up at my party going on now. Oh my gosh!!! My hubby's favorite candy is Reese's! I'll DEFINITELY be making these! Thanks for the follow! I'm returning the <3!!! Oh WOW! They would have to be cut into really small pieces! So devilishly good! Mouth watering..At 30 weeks pregnant I have every reason..or excuse..to make and eat these by myself!Definitely going to try this recipe soon! Thanks! THESE LOOK UHHHHHHHH MAZING!!!!! FOUND THESE THRU THE LADY BEHIND THE CURTAIN LINK UP! That's some serious peanut butter! Looks amazing. Thanks for sharing on Sweet Indulgences Sunday. This sounds wonderful!! Reese Cups are one of my weaknesses! I'll probably replace the Reese's Pieces with nuts, though. Made these using a brownie recipe from allrecipes.com. The brownies took forever to cook (about 60 minutes), but it still came out well. It was very rich and tasty. Ooh! Peanut butter and chocolate on a brownie! YUMMMMM!! Sounds amazing! Can't wait to try one! I want to try all your recipes! Omg these look so good!! I can't believe it only takes these things I thought it would take a lot more. Sold! Costco has a new KS brand peanut butter cup, and this recipe will help me get through the huge bag I couldn't resist buying last time I was there! Yum! Do you mean Reeses pieces that look like m & m's or the peanut butter chips in the bag? I made these today and I they were a hit! I just swirled the cheesecake mixture into the brownie mixture and they turned out great. I also omitted the Reece's pieces (by mistake). Yummy! I just made these - they look delicous! I feel like the proportions are not quite right though. I seem to have too much brownie mix compared to the cheese cake and reese's pieces. Also, I feel like the chocolate melting instructions may lead you to burn the chocolate - I'd recommend a lower temp and longer! All the spoon-licking was good though, so I'm sure the bars will be as well! These look so good, I'm really trying to hold off making these cause they would be to much of a temptation! These look yummy and great but were a bust when I made them. The brownies never cooked all the way through. 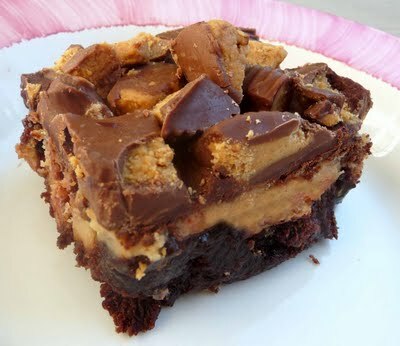 The layer of peanut butter/cream cheese/reese's pieces barely covered the brownie and did not turn out thick like the picture. I was just very disappointed how it turned out, the money it cost to make the product and the fact I couldn't serve it at the function I made it for....I tossed it out. Hopefully someone else had a better outcome...please share if you did. These didn't turn out at all. The brownies were still raw, there wasn't enough of the cheesecake layer, and the chocolate chips didn't melt right in the microwave. I'm really bummed that I spent all this time and money for nothing! I made these they were good, but had to eat them with a fork since the brownies didn't cook all the way through. Did I miss something here? I made these and for some reason could not get the chocolate to melt right (maybe I just wasn't used to the consistency it would make combined with the whipping cream). I tried twice but ran out of time and had to serve them anyway at a baby shower. I was told they were to die for and didn't even need the topping. People devoured them anyway. I'll probably continue to make them this way!